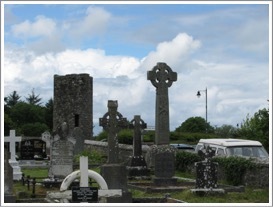 This page describes the crosses in County Sligo. 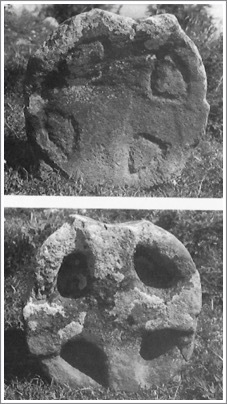 They include a cross, cross-shaft and fragments from Drumcliff; a cross-head at Drumcolumb and a base at Tempolehouse Demesne. The location of County Sligo is indicated by the red star on the map to the right. Stokes reports that it was not until the 9th century that Drumcliff gained notice in the Irish annals. She mentions the following entries. 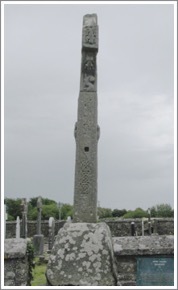 M950.4 Flann Ua Becain, airchinneach of Druim-cliabh, scribe of Ireland, died. 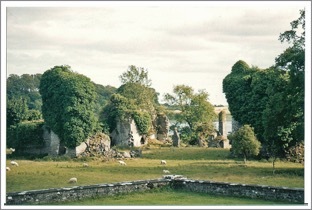 M1029.5 Aedh Ua Ruairc, lord of Dartraighe; and the lord of Cairbre; and Aenghus Ua hAenghusa, airchinneach of Druim-cliabh; and three score persons along with them, were burned in Inis-na-lainne in Cairbre-mor. M1053.4 and Murchadh Ua Beollain, airchinneach of Druim-cliabh, died. M1187.8 Drumcliff was plundered by the son of Melaghlin O'Rourke, Lord of Hy-Briuin and Conmaicne, and by the son of Cathal O'Rourke, accompanied by the English of Meath. But God and St. Columbkille wrought a remarkable miracle in this instance; for the son of Melaghlin O'Rourke was killed in Conmaicne a fortnight afterwards, and the eyes of the son of Cathal O'Rourke were put out by O'Muldory (Flaherty) in revenge of Columbkille. One hundred and twenty of the son of Melaghlin's retainers were also killed throughout Conmaicne and Carbury of Drumcliff, through the miracles of God and St. Columbkille. 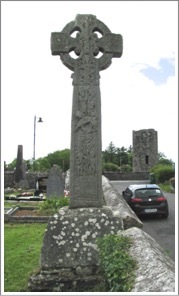 M1225.1 Auliffe O'Beollan (Boland) Erenagh of Drumcliff, a wise and learned man and a general Biatagh, died. M1252.1 Maelmaedhóg O'Beollain, Coarb of Columbkille, at Drumcliff, a man of great esteem and wealth, the most illustrious for hospitality, and the most honoured and venerated by the English and Irish in his time, died. M1267.5 A depredation was committed by the English of West Connaught in Carbury of Drumcliff, and they plundered Easdara Ballysadare. The cross is not divided into separate panels, however the divisions between the images is generally very clear. The descriptions below depend on the work of Harbison (1992 pp. 70-73) and Stokes (pp. 551-556). Where their descriptions diverge , that fact will be indicated. East Face: See the photo to the right. E 1: There is an interlace pattern composed of four circles that Stokes describes as the roots of the Tree of Knowledge. E 2: The Fall of Man. In this image Eve, on the left, appears to eat the apple. At the same time both Eve and Adam hide their nakedness. E 3: An animal in high relief that seems to be a lion. Center of Head: Stokes identified the figure here as a bishop, perhaps St. Columba. Harbison sees this as a depiction of either the Second Coming of Christ or the Last Judgment. The key identifier is the cross held over the right shoulder of the figure. If this were a bishop a crozier would be expected instead. Arms: Each of the arms has five heads. The upper part of the shaft is broken but may contain six heads. Stokes identifies these as cherub heads. Harbison does not attempt an identification. South Side: See the photo to the left. S 1: Bottom panel that is undecorated. S 2: Various interlocking spirals. S 3: blank panel with a mortise hole. S 4: Two interlaced animals with interlacing ribbon. S 5: Top panel of shaft is undecorated. S 6: An animal seems to crouch. Harbison describes this as a lion while Stokes identified it as a stag. Underside of Ring: Harbison describes an animal seen from above and facing down toward the shaft. Stokes identifies this as a seal and frog. West Face: See the photo to the right. W 2: Harbison identifies this scene as the naming of John the Baptist or the presentation of John in the temple. Stokes sees it as the presentation of Jesus in the temple. W 3: An animal figure that Harbison identifies as a camel and Stokes suggests might be an Irish wolf dog. W 4: The smiting of Jesus. Harbison specifies the second mocking. W 5: Harbison suggests this may be the return of Mary and Joseph from Egypt or less likely Zacharias and Elisabeth bring John the Baptist for circumcision. Stokes guesses that the figures could be Mary and John. Center of Head: Crucifixion with lance and sponge. Arms: On each arm is a head. Stokes identifies them as cherub heads while Harbison suggests they may represent the thieves crucified with Jesus. North Side: See the photo to the left. N 3: Blank panel with tortoise hole. N 4: Fretwork with spirals and interlace. N 5: Stokes identifies this as a lion in high relief. Under the ring: An animal in high relief similar to that on the south side. End of Arm: There is another animal similar to that on the underside of the ring. This undecorated cross shaft stands nearly 10 feet in height and stands on a base that is nearly 4 feet in height. A mortise hole in the top is there to receive a missing head. See the photo to the right. 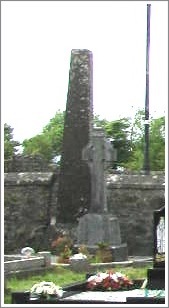 DU018-181—- The shaft of the high cross the base of which stands in the graveyard at Drumcliff, Co. Sligo (SL008-084008) There are two sections of the cross-shaft, joined by a modern concrete filler. 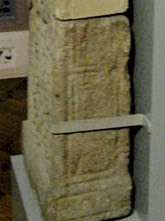 Only one face of the cross is visible as it is displayed standing against a wall. See the photo to the right. The lower fragment measures 22.5 inches high (60 cm), 14.5 inches across (34 cm), and 9 inches thick (22.5 cm). East Face: See the photo to the left. At the bottom of the shaft is a narrow plinth with an empty panel. It is set off by double roll-moulding. Above this there is a pattern of interlace that has four circular motifs that are interconnected. 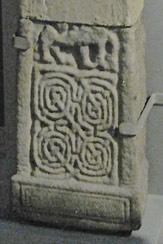 In the center there is a cruciform pattern crossed by strands of the interlace that connect the panels diagonally. The upper fragment measures 32 inches in height (83 cm) and tapers to 10.25 inches near the top (30 cm in the middle of the fragment). It is 6.5 inches (16.5 cm) thick. 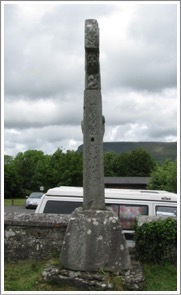 There are two panels on the shaft with part of another panel forming the lower part of the head of the cross. There is an indication on the right side at the top of the shaft that there was probably a ring on the cross. East Face: See the photo to the right. The lower panel represents Abraham’s sacrifice of Isaac. There are two persons depicted. The left hand person is as tall as the panel and holds a club or some other weapon in his right hand. The right hand figure is smaller and appears to lean forward toward the left hand figure. He may be depositing a bundle of faggots on the altar. Above to the right, appearing to be on the back of the right hand figure is a sheep or ram. In the extreme upper right corner is a circle or boss that may represent the angel. The upper panel contains an image of Daniel in the Lion’s Den. Daniel stands in the center of the panel with arms outstretched. On each side of Daniel there is a lion below and above his arms. In the constriction of the arms there is the lower part of a figure that appears to be clothed to the knees. There is not enough context to hazard a guess as to the identity of this image. The Sides: The South side has two panels too worn to identify any patterns. The North side appears to have two undecorated panels. West Face: See the photo to the left. (Harbison, 1992, Vol. 2, Fig. 228) There are two panels on the shaft with another in the constriction of the arms. Harbison identifies the lower panel as an image of the Resurrection. Christ in the center is flanked by angels, one of which holds a staff of some sort. Below, on both sides of Christ’s feet there is a sleeping soldier with his weapon on his shoulder. The upper panel has been identified as a Mocking of Jesus scene. Jesus, the central figure is flanked on each side by a figure taken to be a soldier. Each holds a stick or baton up to Jesus’ face. In the constriction of the arms there is a knot of interlace. A pair of feet are above this but there is no context to venture a guess as to the identification. Stokes, Margaret and Westropp T. J., “Notes on the High Crosses of Moone, Drumcliff, Termonfechin and Killamery”, The Transactions of the Royal Irish Academy, Vol. 31 (1896/1901), pp. 541-578. The cross may be connected with the Knights Templar. They had a foundation at Templehouse. 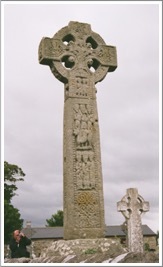 (Historic Environment Viewer) The Knights Templar were active in Ireland from the 12th into the 13th century. Whether an early Christian monastery was there prior to that is unknown. I was unable to find a picture of the cross-base. It is located in the ruins pictured to the left, posted by Martha Bernie on September 17, 2014 and retrieved on 2 June, 2017.